I put in some numbers into the cost of these mini vehicles from new to 30k miles, and new to 100k miles. Of course, this does not include oil changes, and other services. These costs are SOLELY using the MSRP (U.S.) before any fees or extra costs, and using fuel price of 3.50 per U.S. gallon, other than the Cooper which needs premium, and I priced at 3.75. And replaced information if I found differences on the website. MINI data was also collected from FuelEconomy.gov. Reviewing this, bar any errors on my part, the Micra is the best bet at 100k miles. Nice comparison Ultarc! Thanks for doing that. The Micra truly has a shockingly low retail price. I moved your post to its own thread to get some more attention. I was just curious to see, and sure enough the Micra is the best bang for the buck up to 100,000 miles. I am pasting content from a post at Ecomodder I made with more information on forming this comparison, but I did edit the occurrences of the "o" to the proper "a." "I went with the cheapest models. All are standard transmission, and standard transmission EPA estimates- except the Micra, which I used the Forum predictions since no official numbers were available. The only real tosses to change would be rebates, and extra costs like delivery, any financing charges, so on. No matter what, the Micra is still the cheapest to buy (meaning less to finance if one does go that way), and even at 100k, it's fuel economy still makes it the cheapest. I did use highway mileage, and not be rude, but unless one lives in LA or NYC, highway mileage shouldn't be an issue with a standard transmission. My logic behind it was this- oil changes, tire wear, and basic maintenance up to 100k should be level. Also, under the impression if someone wants to buy a new car, and wants the cheapest cost per mile, which is the way to go. My page autopopulates when the data is put in, so any vehicles could be used. I didn't use all of them, just the best power to weight ratio vehicles and tossed in the Chevy and Mitsubishi for good measure. Honestly, I'd probably still have the Mirage. I think depreciation is a fair value, but one it is very subjective, two it really is a total toss up, especially for new vehicles (Mirage and Micra are brand spankin' new), manual transmissions make it harder, too. I would think if someone wanted an economy car, they would be keeping it for the long haul, but planning for more than 100k seemed a bit ridiculous for the average individual." Another interesting point for these seven vehicles is that the breaking point for other cars to have a better Cost/mile ratio is slightly past 200k (Mirage), and 250k (Spark). I made a graph, but since I am using docs.google for my work, it is terrible. Of course there are other variables to consider, but for the most balanced and stable variables, this seems to be the best base. MPG is not the estimated average, I took Highway + City and divided by 2. This is great info, UltArc! Thanks for taking the time to put it together. I'll admit I'm surprised at how much the Micra leads, considering its fuel consumption is higher than the Spark & quite a bit higher than Mirage. There's obviously something to be said for lowest purchase price. I may put together a Canadian version of this comparison using stats from north of the border -- it will change the outcome somewhat because we have slightly different MSRP's, and our fuel prices are quite a bit higher than yours (which will reduce the time a cheaper to buy but thirstier vehicle will hold the lead position). Nice charts. I was thinking the Micra would end up costing more than the Mirage with the mileage difference, but it looks like that doesn't happen for quite a while. Don't forget that less you pay in upfront cost, the less you suffer to depreciation! You should be doing pretty good in resale value. I'd be interested to know if anyone has read anything on how small cars depreciate? Even if it's the same %, your better off than high end cars which just crater at the same % depreciation. Best preowned car buy in a year or two for sure. I think depreciation might be a double edged sword. When I was considering a Fit a few years ago, all the used ones that weren't beat to death or high miles for their age were just a few grand cheaper than new. I figured if I got one, I might as well get new. That'll be even worse with a car that is only $10k new. While it may be worth the same percentage wise compared to a more expensive car, you might have to cut the price for people to consider it over a new one. UltArc - thanks for sending me your spreadsheet! I used only the four least expensive vehicles in Canada, base trim, manual transmission... plus Prius C for comparison to something extra efficient. I looked up each total vehicle price including all taxes, fees, etc. 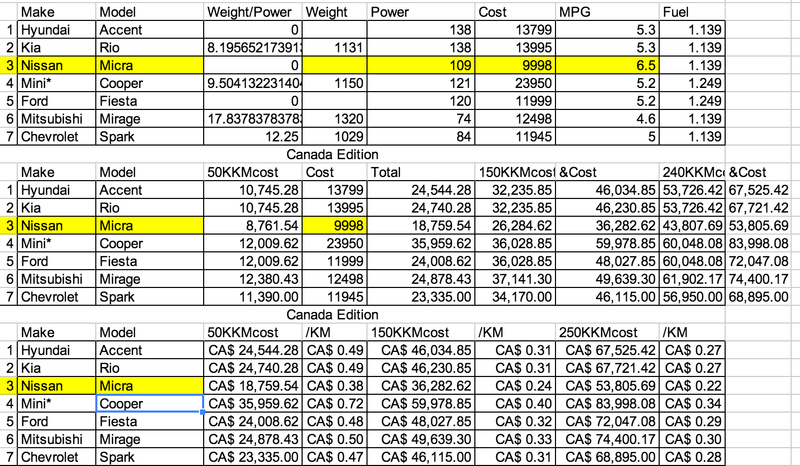 Estimated Micra's freight/delivery/dealer fees based on the Chevy Spark's. Of course, if you drive half as much, the Micra stays in the top spot twice as long. But if fuel prices average more than 1.40 a litre, things change again. We'll have a better idea when we get more info from Nissan. But the truth is, the results are so sensitive to small changes in the starting assusmptions, we really need to wait for the hard numbers from Nissan to button this down. EG. If the Micra's combined rating is 7.4 instead of 7.8 L/100 km, it retains the lead right up to the end of year 10 (200k kms / 120k mi.) instead of year 8.